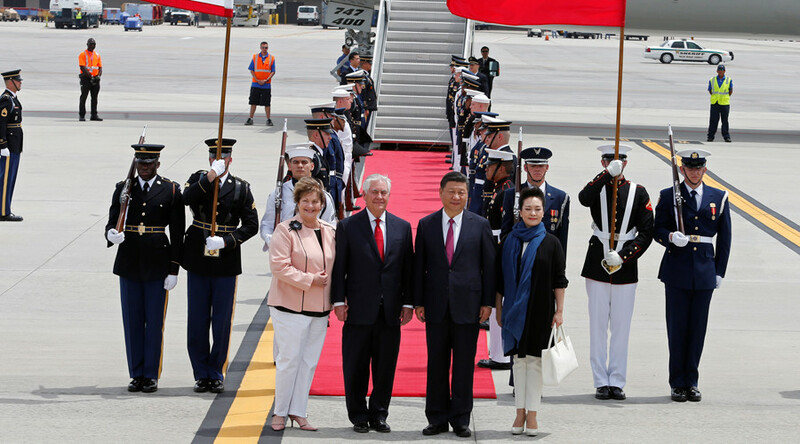 During their two-day summit, President Donald Trump and Chinese President Xi Jinping arrived at new agreements on North Korea, according to US Secretary of State Rex Tillerson. After the summit at Trump’s Mar-a-Lago estate in Palm Beach, Florida, Tillerson told reporters that Trump and Xi came to an agreement on North Korea. Xi also recognized North Korea’s nuclear capabilities have reached a “very serious stage of advancement,” the secretary of state said Friday, Reuters reported. Xi agreed to increase China’s cooperation with the US to pressure North Korea to end their nuclear program, Tillerson said. During the second day of the summit, Friday, Trump said he developed an “outstanding” relationship with Xi and made “tremendous progress” on issues, according to the White House. “We look forward to being together many times in the future. And I believe lots of very potentially bad problems will be going away,” Trump said. Xi said that the meeting helped the two leaders develop a “deeper understanding” and build trust between the two nations. “I believe we will keep developing in a stable way to form friendly relations... For the peace and stability of the world, we will also fulfill our historical responsibility,” Xi said Friday, according to Reuters. At the summit, Xi urged the two nations to come to an agreement on trade and investment, telling Trump that they should promote “healthy development of bilateral trade and investment," according to Reuters. After the meeting, Trump and Xi walked around the grounds of his Florida resort and had a working lunch before Xi’s motorcade left the resort on Friday. Tillerson also said that Trump accepted Xi’s offer to make a state visit to China in the future. "We have a thousand reasons to get China-US relations right, and not one reason to spoil the China-US relationship," Xi told Trump, according to Reuters. Tillerson outlined a “new strategy” in coordination with China on Thursday.